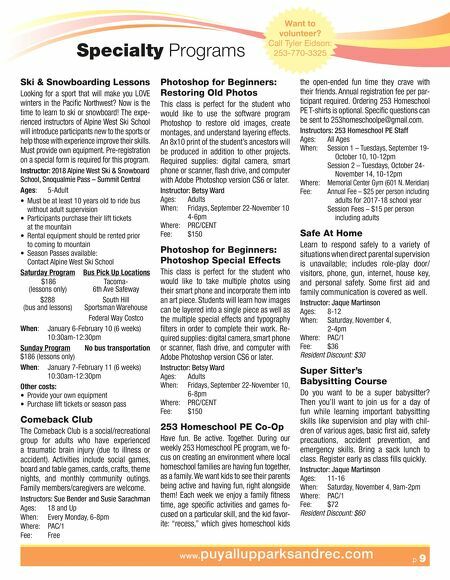 p 8 Call To Register 253-841-5457 Youth Programs Chemical Engineering: Mix it Up! Let's mix things up! Chemical engineering is a specialized field of engineering that focus- es on understanding the molecular structure of materials and objects, and relating this knowledge to synthesizing new technology. Chemical engineering has expanded in re- cent years to include subset fields such as nano, materials, and process engineering. Instructor: Engineering For Kids; engineeringforkids.com Ages: 8-14 When: Wednesdays, September 13- October 18, 6-7:30pm Where: PRC/Cent Fee: $125 Aerospace Engineering: Rockets! (One Day Workshop) Learn the basics of rockets! Students will understand the properties of flight and how they can be modified to propel a rocket. Investigate the overall design components of a rocket, including the nose cone and fin, and how they play a role in the rocket's trajectory and distance. 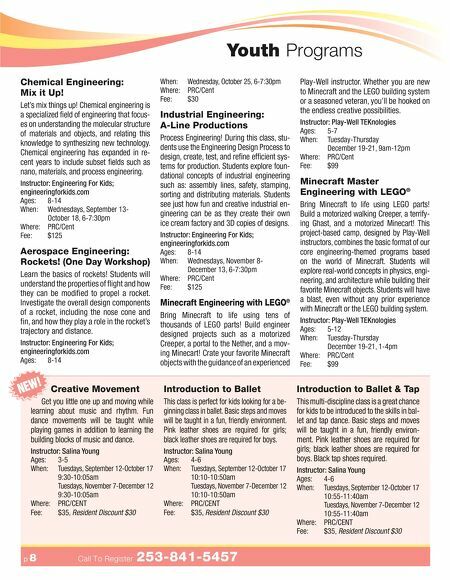 Instructor: Engineering For Kids; engineeringforkids.com Ages: 8-14 When: Wednesday, October 25, 6-7:30pm Where: PRC/Cent Fee: $30 Industrial Engineering: A-Line Productions Process Engineering! During this class, stu- dents use the Engineering Design Process to design, create, test, and refine efficient sys- tems for production. Students explore foun- dational concepts of industrial engineering such as: assembly lines, safety, stamping, sorting and distributing materials. Students see just how fun and creative industrial en - gineering can be as they create their own ice cream factory and 3D copies of designs. Instructor: Engineering For Kids; engineeringforkids.com Ages: 8-14 When: Wednesdays, November 8- December 13, 6-7:30pm Where: PRC/Cent Fee: $125 Minecraft Engineering with LEGO ® Bring Minecraft to life using tens of thousands of LEGO parts! Build engineer designed projects such as a motorized Creeper, a portal to the Nether, and a mov - ing Minecart! Crate your favorite Minecraft objects with the guidance of an experienced Play-Well instructor. Whether you are new to Minecraft and the LEGO building system or a seasoned veteran, you'll be hooked on the endless creative possibilities. Instructor: Play-Well TEKnologies Ages: 5-7 When: Tuesday-Thursday December 19-21, 9am-12pm Where: PRC/Cent Fee: $99 Minecraft Master Engineering with LEGO ® Bring Minecraft to life using LEGO parts! Build a motorized walking Creeper, a terrify- ing Ghast, and a motorized Minecart! This project-based camp, designed by Play-Well instructors, combines the basic format of our core engineering-themed programs based on the world of Minecraft. Students will explore real-world concepts in physics, engi - neering, and architecture while building their favorite Minecraft objects. Students will have a blast, even without any prior experience with Minecraft or the LEGO building system. Instructor: Play-Well TEKnologies Ages: 5-12 When: Tuesday-Thursday December 19-21, 1-4pm Where: PRC/Cent Fee: $99 Creative Movement Get you little one up and moving while learning about music and rhythm. Fun dance movements will be taught while playing games in addition to learning the building blocks of music and dance. Instructor: Salina Young Ages: 3-5 When: Tuesdays, September 12-October 17 9:30-10:05am Tuesdays, November 7-December 12 9:30-10:05am Where: PRC/CENT Fee: $35, Resident Discount $30 Introduction to Ballet This class is perfect for kids looking for a be- ginning class in ballet. Basic steps and moves will be taught in a fun, friendly environment. Pink leather shoes are required for girls; black leather shoes are required for boys. Instructor: Salina Young Ages: 4-6 When: Tuesdays, September 12-October 17 10:10-10:50am Tuesdays, November 7-December 12 10:10-10:50am Where: PRC/CENT Fee: $35, Resident Discount $30 Introduction to Ballet & Tap This multi-discipline class is a great chance for kids to be introduced to the skills in bal- let and tap dance. Basic steps and moves will be taught in a fun, friendly environ- ment. Pink leather shoes are required for girls; black leather shoes are required for boys. Black tap shoes required. Instructor: Salina Young Ages: 4-6 When: Tuesdays, September 12-October 17 10:55-11:40am Tuesdays, November 7-December 12 10:55-11:40am Where: PRC/CENT Fee: $35, Resident Discount $30 Creative Movement Get you little one up and moving while NEW!